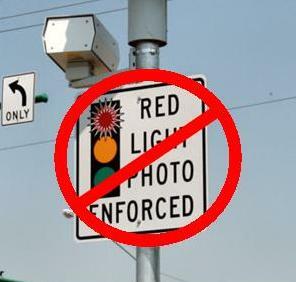 Red Light Cameras are Not About Revenue, They're About Safety - Well, maybe not.. Remember the ads... Red Light Cameras are about safety, not revenue! They rolled out the cops, they rolled out the firemen, they rolled out the ER Docs, all to drive home the point that this was a safety issue, not a revenue one - Right? Well, not so fast there bucko! Now that voters have voted to throw the cameras out, we are hearing a different tune from the City and one of the main advocates of the cameras, the Houston Police Officers Union. According to a KTRH News report, the City of Houston anticipates a $2-3 million shortfall this fiscal year and $8-10 million in subsequent years. The city attorney says that despite the public vote, the cameras will remain until March, 2011. HPOU spokesman, Ray Hunt says, "We might have [to cut] some clerical people, we might have some jailers, we could have anybody who is in a civilian position. And, we'll have to take officers off the streets to fill those positions." Always throw the fear bomb guys... We'll have to take cops off the streets! Will have to lay off firemen! We'll have to let the trash pile up! Isn't it intersting that they always say they are going to cut back on the legitimate and necessary functions of government and never the frivilous stuff? How about the millions the city is spending tearing out perfectly good concrete medians, only to replace them with lush flowerbeds and trees that are not only expensive to put in, but are costly to maintain. How about we privatize the public works department? Perhaps we could reward government employees for effeciency improvements? Or, what the heck! We have the new "Rain Tax" money. We can just raise the rates on that since we haven't really set them anyway! Problem solved! Come on guys... Let's get our act together and find some good government before you are sent packing like 22 members of the Texas Legislature!